Listeria monocytogenes (Listeria) is a type of bacteria that produces the serious infection Listeriosis, the third-leading cause of death from food poisoning (Salmonella and Toxoplasma gondii). Our Listeria lawyers know that listeriosis typically affects the elderly, newborns, pregnant women, and others with weakened immune systems, but occasionally others may be affected. People who have Listeria infections usually require hospital care. Complications often include pneumonia, hydrocephalus, encephalitis, seizures, brain stem damage, miscarriage, and stillbirth. If you are made sick due to exposure to Listeria monocytogenes in contaminated food, the experienced product liability attorneys at Moll Law Group are available to represent you seek recovery for your injuries. Billions of dollars have been recovered in cases in which we were involved. Food is considered a product for purposes of product liability. In these cases, you need to prove a defect. The presence of a pathogen such as Listeria monocytogenes is a manufacturing defect that can occur at any stage of the food manufacturing process. Manufacturing defects occur when there is a deviation from the intended design, resulting in a product that is more dangerous than consumers expect it to be. Listeria is a hardy organism that can contaminate numerous uncooked foods, such as sprouts, cheese, fruit, ice cream, and deli meats. Common sources of outbreaks are hot dogs, lunch meats, sausages, and soft cheeses. In some cases, illnesses do not develop until weeks after exposure to the Listeria-contaminated food, making it difficult to determine the appropriate defendant. 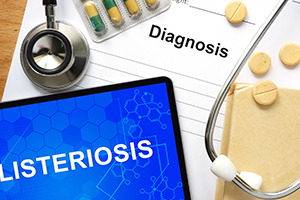 If you believe that you have suffered from a form of food poisoning, such as Listeriosis, it is important to ask your doctor to perform any necessary tests to determine the pathogen responsible. In many cases, Listeriosis arises in an outbreak, affecting a large group of people. The state department and CDC may then collect substantial data that can be used to determine the appropriate defendants and prove the elements of a lawsuit. In most cases, it is critical for your Listeria lawyer to retain credible experts, including a microbiologist, sanitation expert, epidemiologist, infectious disease expert, or physician experts. In a wrongful death case based on a pregnancy that results in a miscarriage or stillbirth due to Listeriosis, it may be necessary to retain a maternal and fetal medicine expert. As with other food contamination cases, there may be challenging technical issues surrounding medical causation. For example, in a high-risk pregnancy, the defendants may argue that some other risk factor and not Listeriosis caused the death of the fetus, particularly if the pregnancy loss occurs long after exposure to the bacteria. Similarly, Listeria can breach the blood-brain barrier, causing meningitis, but it may be difficult to trace the meningitis to the consumption of a particular contaminated food. Without food leftovers to test for the presence of Listeria monocytogenes, it may be necessary to employ alternative theories. Under the "malfunction doctrine" in the Third Restatement of Products Liability (adopted by some jurisdictions), for example, a fact finder can infer the existing of a manufacturing defect by establishing that a product malfunctioned during the normal use of the product, and that the product was not changed or altered such that the malfunction could be caused by the alteration. If you suffered substantial harm due to Listeria monocytogenes, our product liability lawyers are available to help you seek recovery for your injuries. We assist injured consumers throughout the nation, including in California, Florida, New York, Pennsylvania, Ohio, Texas, Illinois, and Arizona. Call us at 312-462-1700 or use our online form to set up a free consultation with a Listeria attorney.